The best stained glass grinders in the world are one of the most essential parts of any stained glass artist’s toolkit! Your simple saw or cutter can only go so far in shaping those intricate pieces. At that point, the glass grinder comes into the picture. Your art will see a radical shift in quality and your showmanship will be best highlighted when you go in for a glass grinder! However, making the call on which grinder to get can become unnecessarily arduous – if you don’t plan it right. To make your decision easier, we have reviewed five of the best stained glass grinders on the market today, followed by a buyer’s guide section to help you make the best choice. Without further ado, let’s start with the reviews! 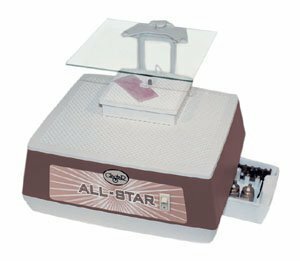 The Glastar Super Star II is one of the most well-appointed grinders on the market today, and should be on top of your list if you’re starting out or are a hobbyist stained glass artist. The features include a quiet yet durable motor, a cooling drain which is effective and useful, as well as an accessory drawer for storing your drill bits and accessories. 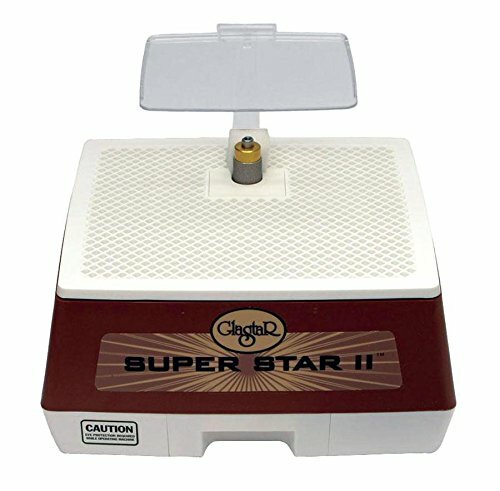 The Super Star II features a motor with 19 ounce per inch of torque. Hence, we recommend it for those just starting out and learning the art of stained glass work. It is also good for hobbyists who don’t work on much larger projects than beginners do. However, should you occasionally require harder work, the maximum rpm it can hit is 3450 – which is as good as most professional grinder motors. Besides this, there is nothing on the Super Star II which suggests its entry level intentions. This is because it comes with a vast array of features which were hitherto unseen on “entry level” stained glass grinders, such as a cooling drain and a drawer to store tidbits in, which is generously sized. Also featured is the rubber splash guard, which is a necessity while working and makes for a much better user experience when working on wet cuts. Despite being intended for audiences which are just beginning their journey towards craftsmanship, the Super Star II does not disappoint as a general use tool. As a hobbyist grinder, it does all that is expected of it, and then some. 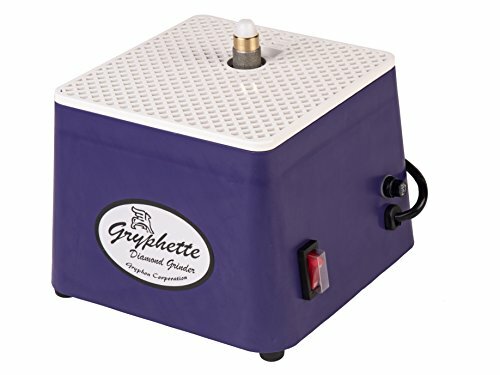 A strong recommendation for the best beginner level stained glass grinder on the market today. Akin to the Super Star II introduced above, the Glastar All Star G8 features impeccable build quality and features which make it a solid buy. With 42 ounces per inch of torque and a glass shield to protect your eyes from being spoiled during work amongst countless other features, this is an ideal tool for any stained glass artist. The All Star G8 comes with everything that you need or may want from a stained glass grinder. The aesthetically well-designed grinder comes with 42 ounces per inch of torque, which makes it one of the most powerful machines on the market. As if this weren’t enough, it can readily hit a maximum of 3,560 rpm. Having talked about power, we move on the overall experience. The grinding work area is large enough for any kind of work, measuring 11” by 13” – around a fifth bigger in size than most of its direct competitors. The glass shield to protect your eyes is a welcome addition, and so is the accessory drawer. 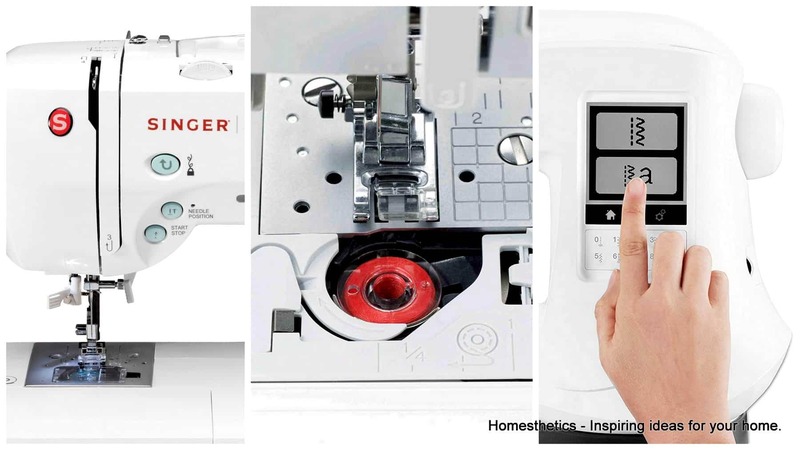 The features and user experience, which is effortless, make it hard not to recommend a machine as well appointed as the All Star G8. However, this product does come at a steeper price. The All Star G8 is the only option on this list which comes with zero compromises as far as the features are concerned. Even though this is a premium product, it delivers such a solid working experience that it is hard not to recommend it. A truly wonderful stained glass grinder. POWERFUL DC MOTOR - 0.67 amp, 3000 rpm. Gryphon is generally known for having products which are unique in design and use, and the Convertible is a prime example of that. It comes with a novel surface which can be bent at an angle that is convenient to you for grinding, along with the usual features one might expect from a stained glass grinder. First, a note about the elephant in the room – the inclined workspace. It is a brilliant idea, since it gives you the kind of flexibility which is unheard of in this segment. Further, it is also easier on the neck and your back, with the strain being minimised from not having to stand while grinding. It also comes with a glass cover to protect your eyes while working, which inclines along with the workspace. It features a super powerful 67 ounce per inch motor, that can hit up to 3000 rpm if desired. A second storey surface can also be optioned should you need it for those smaller cuts. Overall, aside from the lower rpm, there is not much else to fault the Gryphon Convertible besides the build quality (it is made of plastic). 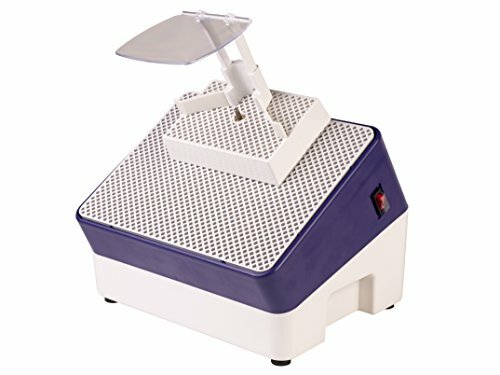 Despite the shortcomings, it is one of the most unique additions to the stained glass grinder market, and is, without a doubt, one of the most ergonomically designed grinders on sale today. With a brilliant design, a torquey motor and a wonderful work surface to boot, the Gryphon Convertible is one of the most versatile and rounded products on the market today. Sure, the build quality might not be the best in the business, but the features more than make up for it. The Power Max Deluxe II is a perfect addition for anyone looking for a mid range stained glass grinder. Coming in with almost every feature one can think of with a stained glass grinder, including a super efficient water based cooling system, and ample space to work, this works out as one of the best compromises between power and features. The Power Max Deluxe II delivers a solid bang for the buck with an anti-seize lubricant, a face shield which actually works, a foot pedal to control the speed as per your need, as well as three different bit sizes to make sure you get the desired width and shape of the grinding. The compromises come in the physical size, which is smaller than most offerings, but is still large enough for medium sized projects. The other compromise comes in the form of a slow 2300 rpm speed, which can deal with a variety of projects but not all of them. This makes it ideal for beginner to mid level projects. You also have more accessories as standard than the ones that come with higher end offerings. 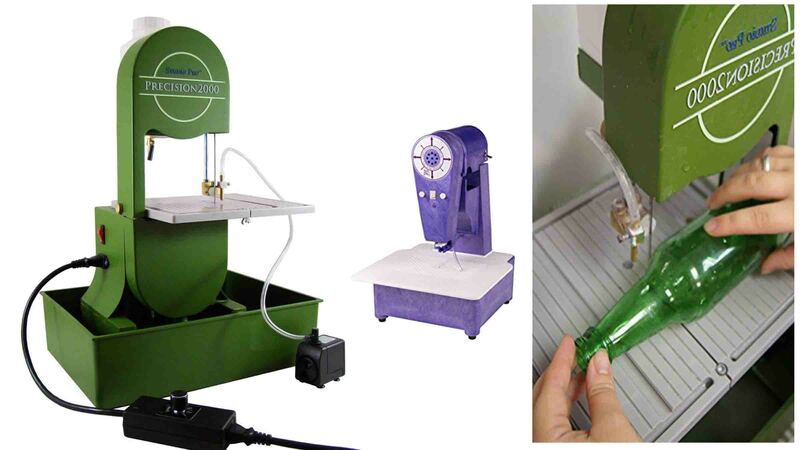 Further, the cooling system is one of the truly unique additions to the stained glass grinder market. This one comes with compromises, but ones that trade firepower for sheer convenience. This is one of the best overall grinders on the market, coming in with a plethora of features and enough firepower to grind most stained glass pieces to perfection. The middleweight champion, in boxing parlance. 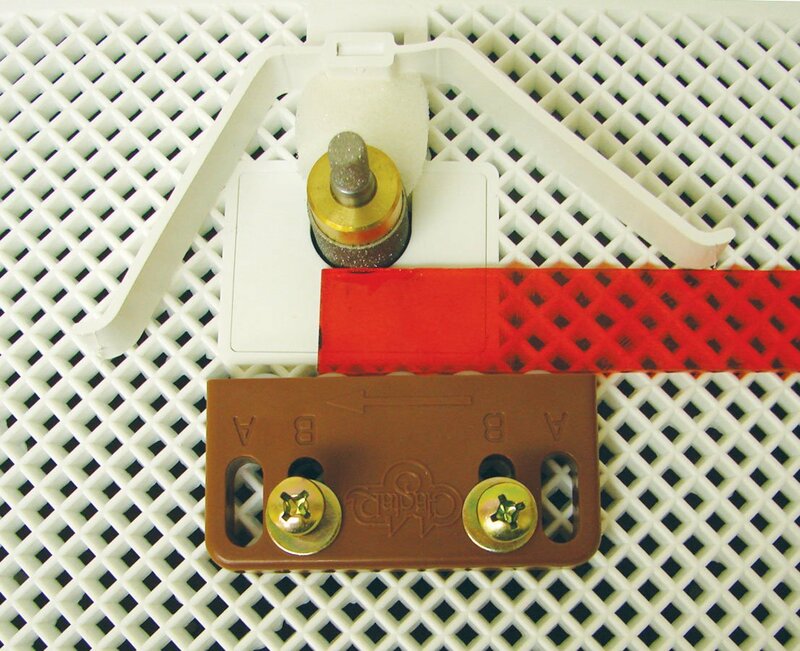 SPARE FUSE - 3 amps, fast acting. SIMPLE DESIGN - Perfect for beginners. The Gryphon Gryphette is another nice product by Gryphon, which comes in at a wonderful price point with many features. It is a compact, sturdy grinder which is best suited for students and budding artists, given that it does not require much space yet offers powerful grinding capabilities with its 0.67 ampere motor. This small wonder of a stained glass grinder is perfect for those looking for a value for money yet useful grinder. It has a rather powerful 3000 rpm on a surface which is less than 7 inches by 7 inches square – perfect for a dorm room which is already space starved. A lot of the other professional grinders have many features which are nice to have, but come at a premium. This product is ideal for those willing to learn the art of stained glass grinding, but without spending hundreds of dollars to achieve it. It comes in as a refreshing change, wherein we have a grinder which does the job, for less. This is a radical departure from all the other offerings – it only does the job, but it does the job very well. You won’t be feeling the need for another grinder with this. Granted, there are many compromises to be made, but the most important fact remains; it shouldn’t have to take hundreds of dollars to have a nicely working stained glass grinder. 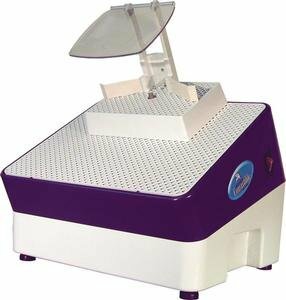 Now that we’re done with reviewing the most important new stained glass grinders, here are some important factors you need to consider while buying a stained glass grinder. The first thing you need to consider is the rotations per minute (rpm) with which the grinder’s motor rotates. Generally speaking this ranges from somewhere between 2,800 to 3,600 rpm. A faster rpm leads to a smoother finish on the glass edges – hence you’re better off going with a faster motor. Another consideration which is equally important is the torque figure. It indicates how powerful a motor is, in that how much speed it can sustain and how fast it attains that speed. Around 20 ounces per inch of torque is ideal for those who are stained glass hobbyists, and is the perfect amount for beginners. Between 20 to 35 ounces per inch of torque is necessary for most consumer grade projects. 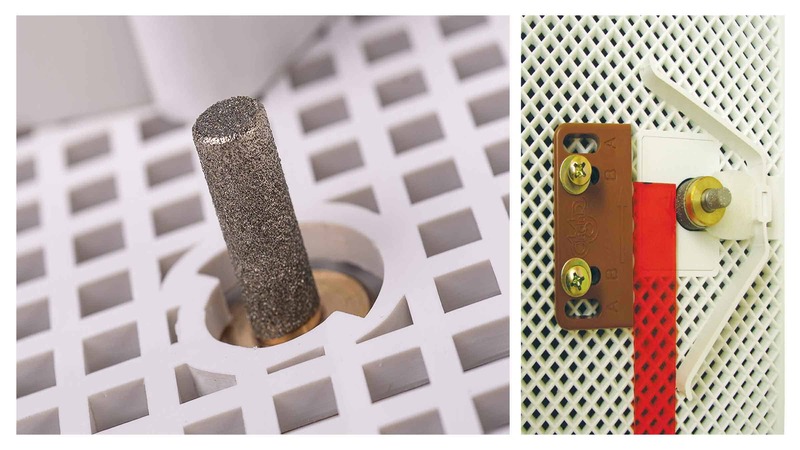 A figure of anywhere over 40 ounces per inch gives you a lasting piece of mind in that your equipment won’t feel lasting for power no matter the scope of the project. Somewhere between $100-$150 gets you a basic stained glass grinder. Low power, low torque, but still gets the job done. These work wonderfully with regards to hobby projects or at the beginning stages. 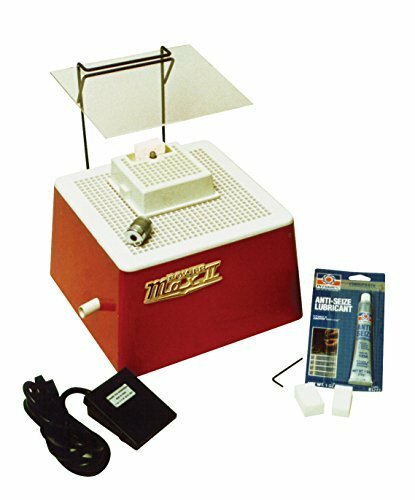 From around $150 till $500 will fetch you a proper, industrial level glass grinder. These have all the power you might need at any time, and do not skimp on any important features. The major accessories you will require are adequate protection for your face, the bit size (large bits or small bits), foot pedals to control the speed, as well as multiple work surfaces to work on different glass pieces at once. 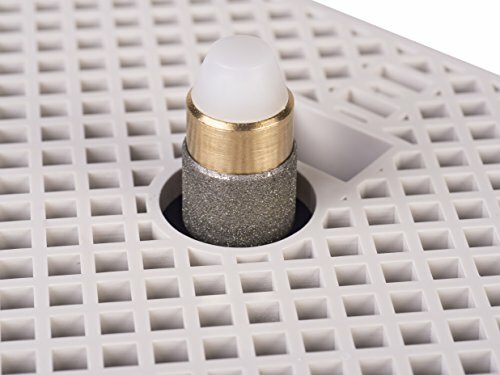 The bits are usually provided with the grinders, but some of these listed accessories are essential (such as protection). Lastly, you also need to consider the surface area that you get on the grinder. A larger surface is generally preferred, but you need to consider how much space you have yourself to keep it. Another possibility is to keep multiple surfaces ready in case you have large variations in the size of the glass pieces that you tend to deal with. Now that you’ve seen the best offerings on the market, you know what you’re walking into while purchasing a new stained glass grinder. Further, with the buyers guide, you’re aware of the factors you have to keep in mind in the process of buying a grinder. You’re now ready to go out there and get cracking with a new grinder for your stained glass work!